Lieutenant General J S Sandhu has taken charge as the General officer Commanding of the Army's strategic Chinar Corps which is responsible for guarding the Line of Control in Kashmir Valley. Sandhu, who became the 46th Corps Commander of Chinar Corps, took over from Lt Gen Satish Dua on Monday, an army spokesman said. Commissioned into the 5th Gorkha Rifles regiment, he has had an illustrious military career spanning 36 years during which he held several prestigious command, staff and instructional appointments, the spokesman said. 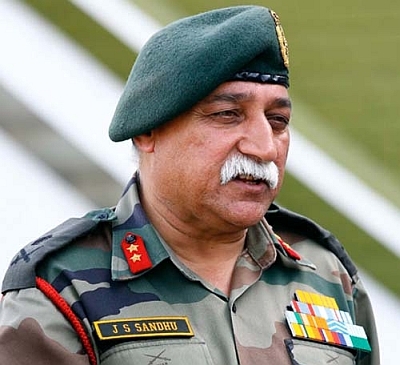 "The General officer has an incisive understanding of Jammu and Kashmir, having served five earlier stints in the state, including command of an Infantry Battalion on the Line of Control, a Mountain Brigade and the elite Kupwara Division," he said. A graduate of the Defence Services Staff College, Higher Command Course and National Defence College, Sandhu has also served in the Army Headquarters, Infantry School, Army War College and the DSSC. He has also represented the country in the Indian Embassy at Kathmandu, Nepal. On assuming the charge, he conveyed his greetings to the people of Kashmir and the entire Chinar Corps fraternity. Earlier on Monday, Lt Gen Dua was given a farewell in Badami Bagh Cantonment which began with both the general officers laying wreath at the War Memorial to pay homage to martyrs. Dua's tenure, which began on August 27 last year, has been characterized by a balanced approach of robust operations along the LoC and in hinterland on one hand, and constructive engagement with the populace, especially the youth on the other, the spokesman said. The Army has played a significant role in the ongoing unrest assisting the civil administration in restoring peace and calm, he said. Dua's tenure though, will be defined by the successful surgical strikes in September launched by the Army in response to the Uri terror attack, he said. Dua now proceeds to New Delhi on promotion to assume the charge of Chief of Integrated Staff to the Chairman, Chiefs of Staff Committee. He expressed hope that the situation in the Valley would soon return to normal and conveyed his best wishes to the people of Kashmir and soldiers of Chinar Corps.